This is another beer I purchased at Top Shelf Brews in Hampton, New Hampshire as Oskar Blues does not distribute to Maine. Their beer is sold in 4 packs of 16 ounce cans and Top Shelf seemed to have them all in stock when I visited them last month. 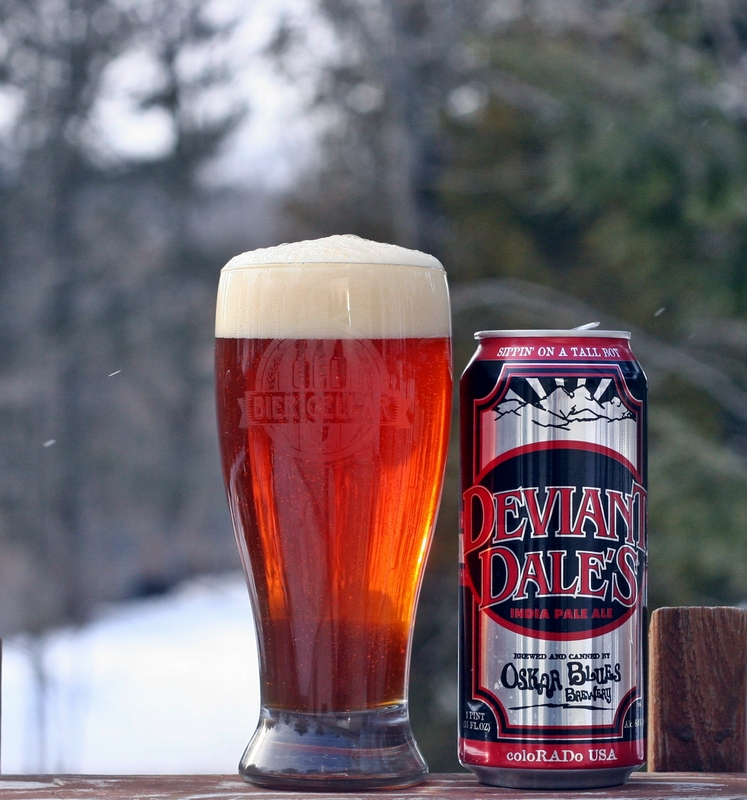 Deviant Dale’s is a beautiful beer with a deep orange color and thick off white head that goes well above the rim of the glass. Citrus and pine hops make up the aroma on this one, not my favorite IPA as far as aroma goes but certainly solid. The taste is very well balanced for a fairly high ABV IPA with plenty of malts to balance out the piney, resin hops. Alcohol is completely hidden with no hint that it is 8% ABV. This beer is a bit thick and not something I would drink more than one in any session but overall it is a solid IPA that is worth picking up if you happen to be in a New Hampshire beer store. Brewers Description: Deviant Dale’s IPA (8% ABV, 85 IBUs) was born at the crossroads, in a juke joint, as if Dale’s Pale Ale sold its soul to balance Deviant’s foreboding aromas of citrus, grapefruit rind and piney resins with a copper ball-of-fire color and inscrutable finish. The 2011 GABF Silver Medal Winner (American IPA Category) is the Devil incarnate with untold amounts of malt and hedonistic Columbus dry-hopping. Oskar Blues’ southern spirit caught a northbound blues bus to ColoRADo to deliver the boundary bustin’ brewery’s first 16 oz. tallboy can.